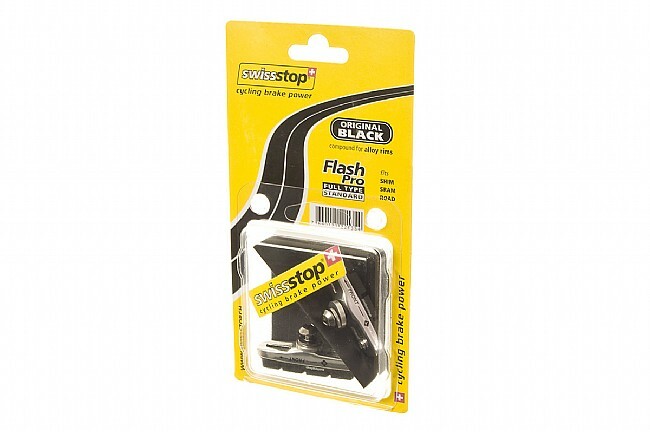 Stop faster with SwissStop's high performance brake shoes. Advanced materials and an incredibly detailed pad production process ensure the powerful braking performance and superior modulation relied on by pro riders. The FlashPro Full Brake Shoes feature pads and holders for use with Shimano, SRAM road, Bontrager and TRP holders. Available in three rubber compounds. This version uses the original Black compound for high mileage and all-conditions performance. Designed for use with aluminum rims. Silver alloy holders. Two shoes per set (enough to retrofit a single brake). Easy to install, work well in all sorts of weather - tested them in pouring rain last weekend!